The RSA and JBL have partnered together to offer a new skate maintenance program to RSA members! This new system, aptly named MySkateRepair was created by rink operators to help simplify the task of documenting skate inspections, maintenance and repairs. The new program is all electronic, no pesky stacks of paper lying around, and is very user-friendly. The MySkateRepair system includes both an App to be used by personnel completing the repairs and inspections and a Panel for Managers/Operators to use for reviewing and reporting. The program requires some setup including entering all skates into the system using their assigned number but the data can be easily uploaded in bulk to simplify the task. Staff members also need to be setup with login information and permissions. Each staff member can be given different authorizations to allow them to perform certain tasks within the system; inspecting, performing repairs, washing wheels, etc. Once the system is set up, the functions for inspecting and repairing can be done on an Ipad or any other electronic device either in the skate room or at a PC in the office. To enter a repair the user simply enters the skate number, checks off the corresponding repairs and enters any parts used. 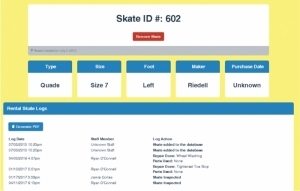 The Parts feature is not mandatory but can be used to track inventory and receipt of parts used for each type of skate. Once the Finish Repair button is selected, an entry is automatically created and attached to that particular skate number. Skate Inspections are done by skate type and size. Any skates that don’t pass inspection are logged accordingly. The employee then attests to the fact that all inspections were completed within that size. A record of inspection will then automatically be placed on every skate within that size. The employee would then repair the skates as needed and log those accordingly. Insurance companies usually set a standard on how often rental skates should be inspected and can deny claims based on inspections not being completed. For example JBL requires that all rental skates be inspected every three months. MySkateRepair is designed to alert you two weeks in advance of a size coming up to their three month mark so you can ensure all of your inspections are completed every quarter. MySkateRepair offers numerous reporting capabilities including a breakdown of your inventory by skate type and size, repairs and/or inspections completed during a given time period, and a log of all activity performed on a specific skate. This report is the most important when it comes to fighting a lawsuit. The program can also store accident reports and mark skates that were involved in accidents. You can also mark skates as missing or destroyed so that your inventory of skates is always accurate, making placing orders with your skate vendor easier. MySkateRepair will replace all of your paper based logs, cut down on time needed to document by hand and make your skate maintenance more efficient all around. This program is free to RSA members that currently use JBL as their liability insurance provider and is $300 for all other RSA members. If you are a current RSA member, please feel free to watch the webinar here. To schedule a demo email info@mySKATErepair.com or contact KC Perkins at (317) 347-2626 x194. See plans here.